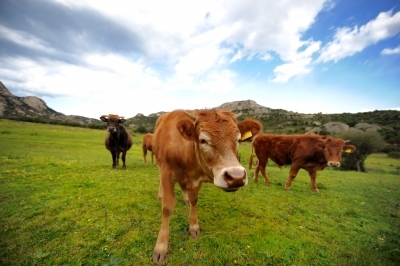 Making livestock farming more sustainable – One Billion Hungry: Can We Feed the World? 4) Adopt smart supplements. Specific plant extracts can help microbial populations in the rumen to grow faster, using nitrogen and energy more efficiently and boosting yields without significantly increasing GHG emissions. And smart supplements don’t have to be expensive: a water fern in India is a source of extra protein for cattle and goats. 5) Eat quality not quantity. We know in the developed world we generally eat too much meat, more than is healthy or sustainable and much of it from heavily processed foods. The poorest people in the world do not get enough meat, an important source of protein, amino acids and iron needed for physical and mental development. The objective, therefore, should be a balanced consumption of high quality meat, a weekly average consumption of red meat of no more than 300 grams. 6) Tailor practices to local culture. In some communities, livestock farming practices are intertwined with their culture and introducing conventional farming can disrupt these dynamics. Both natural and cultural, social and physical factors need to be considered when developing more sustainable livestock systems. 7) Track costs and benefits. Understanding which livestock systems will work in different places is not just a case of yields but of trade-offs between economic costs and benefits as well as social and environmental factors. A farming system that boosts yields above all else may have significant costs for the climate. 8) Study best practices. There is no one-size fits all solution and to truly design sustainable livestock systems we will require multidisciplinary research to fit a variety of contexts. To help enable such collaboration, authors of the commentary have developed three global farms platforms: the University of Western Australia Future Farm in Pingelly, the Thiruvazhamkunnu Livestock Research Station in Kerala, India, and Rothamsted Research North Wyke Farm Platform in Devon, UK. There are also plans to establish further platforms in South America, North America and China. Improving production efficiency through the use of better quality feed and feed designed to lower enteric and manure emissions. Improving breeding and animal health to reduce the amounts of un-useable animal products and emissions related to them. Using manure management practices to recycle and recover nutrients and energy contained in manure. Sourcing low emission inputs such as feed. Feeding additives, vaccines and genetic selection methods also have the potential to reduce GHG emissions but they require further research and development. The report states that, “A 30 percent reduction of GHG emissions would be possible, for example, if producers in a given system, region and climate adopted the technologies and practice currently used by the 10 percent of producers with the lowest emission intensity.” The largest part of this mitigation potential is in low productivity ruminant systems found mainly in South Asia, Latin America and the Caribbean, and Africa, and achieved through better feeding, animal health and herd management. In the developed world, and where efficiency may already be high, large emissions reductions can still be attained through manure management, energy use and the sourcing of feed with lower emission intensity. As meat production is set to double by 2050, the challenge of meeting current and future meat demand sustainably is one of urgency. We need lots of different areas of science to come together from the social, political and economic sciences to the biological and ecological. One thing is very clear from these two reports, we have the know-how and tools to make livestock farming more sustainable but it is still going to be a challenge to achieve it.